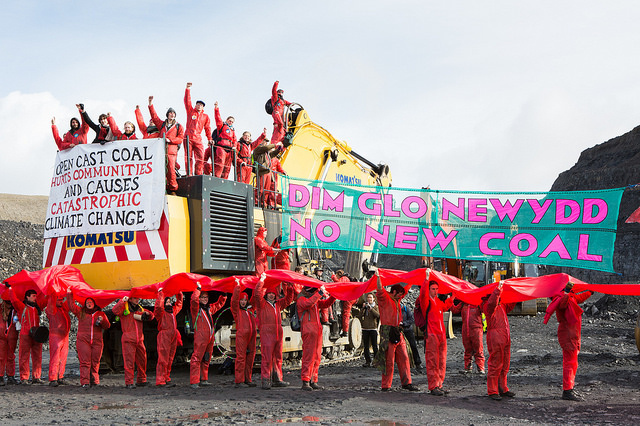 Welsh climate activists invoked the mythical red dragon to say 'Break Free from fossil fuels' and 'No New Coal'. 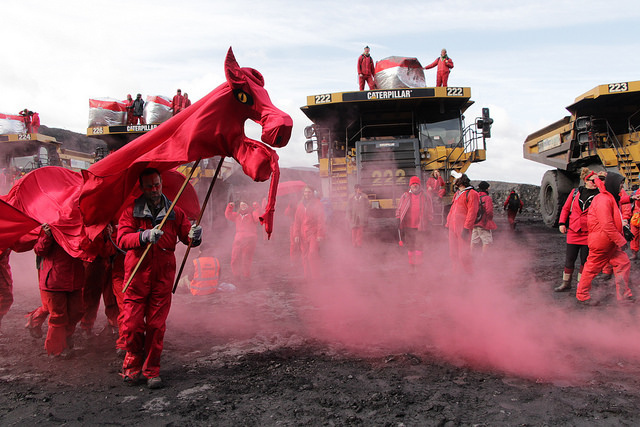 A red puppet dragon was used in the civil disobedient occupation of the Ffos-y-fran open cut mine in South Wales on May 3. This is the largest open cast coal mine in the United Kingdom. About 300 people walked on to the minesite at 5.30am and shut down all operations for the day. With the peaceful occupation, no arrests were reported. The activists were part of the global #BreakFree protests targeting coal and fossil fuel infrastructure around the world. Miller Argent is the corporation responsible for Ffos-y-fran. They are planning a new huge coal pit just next door at Nant Llesg. They have been met with resistance from the local community to stop their mine expansion which would destroy common land that offers grazing and wildlife biodiversity. 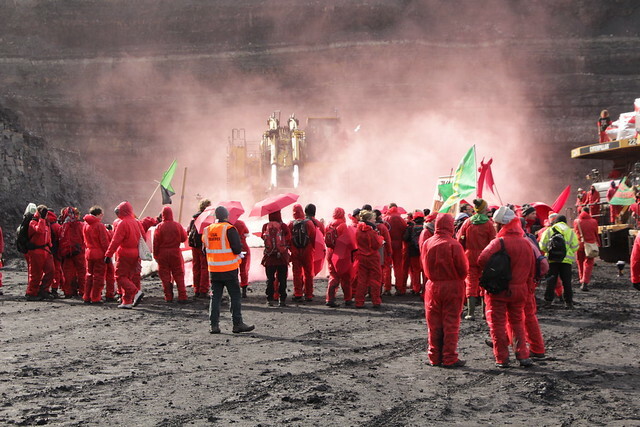 The protesters marched onto the coal mine, walked around, draped banners over the equipment, played soccer and had a dance party for 12 hours. They dressed themselves in red boilersuits and used creative props such as inflatable cubes, dragon puppets and metres-long red banners. At least one of the banners was from the D12 march at the UN climate talks in Paris in December 2015. From 5.30am onwards activists effectively halted all work on the site. “Today we shut down the UK’s largest coal mine because we must keep fossil fuels in the ground to stop catastrophic climate change. Continuing to dig up coal is a red line for the climate that we won’t allow governments and corporations to cross. The occupation came at the end of a four day 'End Coal Now' camp by Reclaim the Power on common land near Ffos-y-fran. At the camp activists organised events with residents, unions, councillors and Assembly candidates to highlight the potential for thousands of sustainable jobs in clean energy industries, rather than the opencast mining that has devastated the local area. The occupation supported United Valleys Action Group who have been campaigning and resisting the proposed mine at Nant Llesg. Local resident tell how their voices are not been heard over their fears about open cast coal mines, and how they feel about Reclaim The Power Action Camp coming to their area. Some great aerial photography here of the occupation along with commentary on the action.